Chilion C. M. Farrar and his wife, Sarah Arnold Nisbet. #506 Delaware was built in 1870 by Chillion M. Farrar, who had been born in Detroit in 1829. He came to Buffalo in the 1840s and found employment in the Sidney Shepard Iron Works. 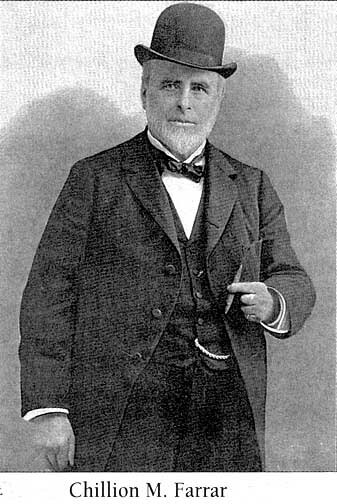 In 1871 Shepard sold out to William King who changed the name of the plant to his own and began to specialize in stationary and marine steam engines. Farrar moved up to manager. At the same time John Trefts, a native of Pittsburgh who arrived in Buffalo in 1845, took a similar position with the George Tifft foundry. Farrar and Trefts together with Theodore C. Knight, the father of ex-Mayor Erastus C. Knight, formed a partnership, Farrar Trefts & Knight, until 1869 when, with the departure of Knight, it became Farrar & Trefts. For forty years they turned out excellent metalwork in the form of locomotive and stationary boilers, metal tanks, stocks, and stills. They produced aluminum, iron, and brass castings, pattern work, gas engines, grade bars, and propellers. 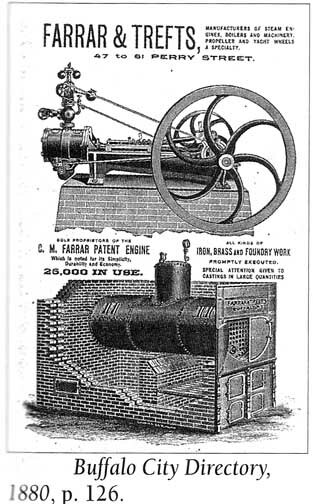 With the growth of the oil industry, they began making boilers and engines for oil producers, selling nearly 20,000 of these not only at home but in Europe and India. 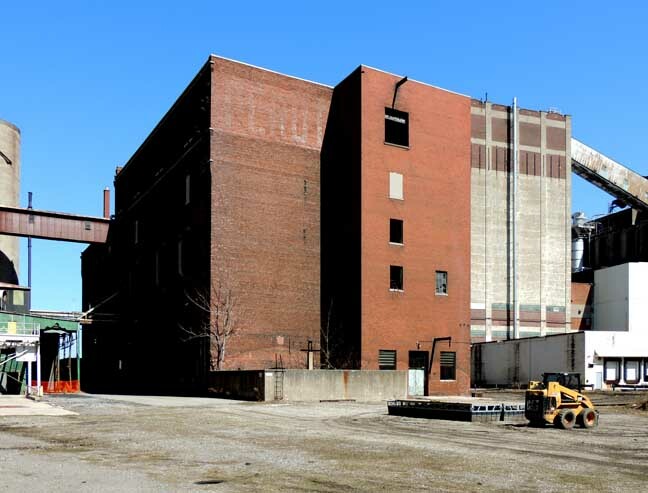 The foundry on Perry Street - #47 to #61 - covered an acre on both sides of the street with 200,000 square feet of floor space. A second plant in East Buffalo employed about 600 men engaged in blacksmithing, forging, and repairing gas engines. A visitor to the Farrar home entered a large hall. On the left was a parlor with an open fireplace. 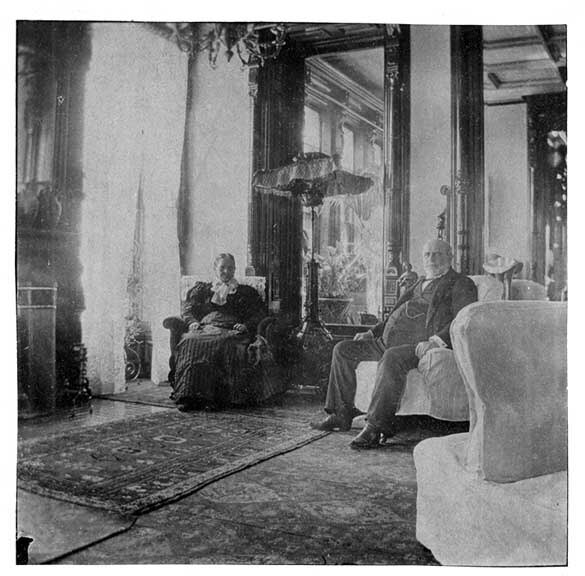 Another long room opened onto the spacious porch where, during his ill-stared visit to Buffalo in 1901, President McKinley paused for a chat with Farrar. A third living room larger than the others ran the width of the house and contained an ample fireplace and one large mirror with a walnut frame. Also on the first floor was a dining room designed for hospitality, a breakfast nook,and two conservatories with great palms, aspidistra, and flowers. Throughout the mansion, built without regard for cost, rare woods such as mahogany and walnut were used for paneling. Furnishings were of fine workmanship, while, to satisfy Mrs. Farrar's love of dark red, most of the hangings were of that color. The walls were covered not with paper but with brocades and tapestries. 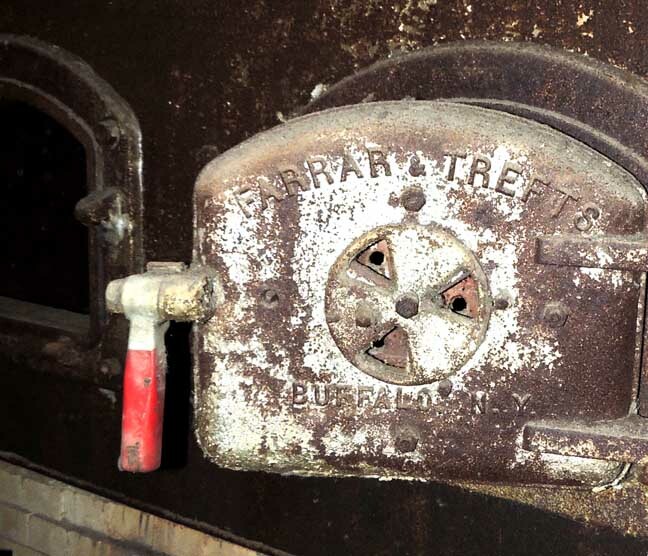 The kitchen was in the basement, assuring a cool dining room during summer when cooking was still being done on a heat-radiating coal stove. A dumbwaiter transported food from there to the first floor. Trefts and Farrar were joined together by other bonds than business. They married sisters. Trefts wed Evangeline Siver, and Farrar married Alvira Siver in 1856. Each sister each had one daughter, Evadne Trefts and Anna Mullet Farrar. These cousins in turn married brothers; Evadne married William H. Holloway and Anna in 1874 married John A. Holloway. The John Holloways lived at #506 until John's death in 1890. The patriarch, Chillion himself, had no time for clubs or sports or world travel. He lived a monotonous life, never took a prolonged rest or vacation, and never sought public office as his concentration on his industrial projects occupied both his mind and time. He died in 1907. His funeral was a melange of Masonic ritual and Episcopal rite, conducted at home by Rev. Cameron J. Davis. Farrar's widow lived there until her death. Her granddaughter, Mrs. Nisbet Grammer, the former Evadne Holloway, who had been born at #506, resided there until 1916 when it was sold to the Knights of Columbus. The Knights built an addition to the rear with gymnasium, swimming pool, and steambaths. The roughly contemporaneous erection of the gigantic new cathedral on Delaware and West Utica was, along with what some Protestants referred to as the Catholic Club, a statement by Buffalo's Catholics that they were now a presence to be reckoned with on the Avenue which had hitherto been a WASP bastion. Chillon M. Farrar, inventor of a reversible steam engine, much used in boring oil and artesian wells, formed a partnership, in 1864, with John Trefts and Theodore C. Knight, and the firm established a modest plant that year, on Perry Street, for the manufacture of engines and boilers and for general machine work. Mr. Knight retired from the firm in 1869, and the business, grown large with the years, has continued ever since under the name of Farrar & Trefts. In conjunction with Rood & Brown, manufacturers of car wheels, the firm established also the general foundry business of the East Buffalo Iron Works, on the New York Central Belt Line, near Broadway.